Posted on Thu, Apr 5, 2012 : 10:20 a.m. In older homes, some of us are lucky enough to have a private master bathroom. That’s the good news. The bad news is that, if they are original to the house, they may not have enough room to turn around in, let along accommodate two people getting ready at the same time. The other bad news is that there is rarely enough room to enlarge it without sacrificing a bedroom. This stately colonial was ordered upstairs much like a four-square. There was a bedroom in each corner (A, B, C, & D), with the master bedroom (A) slightly larger. This bedroom had two luxuries for its day — two closets (E & F) and a miniature bathroom (G). This bathroom was so small that one could barely raise one's arms in the corner shower. There was absolutely no space for any storage. The hall bath (H) was spacious enough. Like the master bath, it still had the original plumbing fixtures. Since they were in great shape, and the homeowners liked the funky colors, it was smart to leave this bath the way it was. The stair hall (I) was gracious, with curved walls and beautiful woodwork. The homeowners did not require a lavish master bathroom; they just wanted more room. 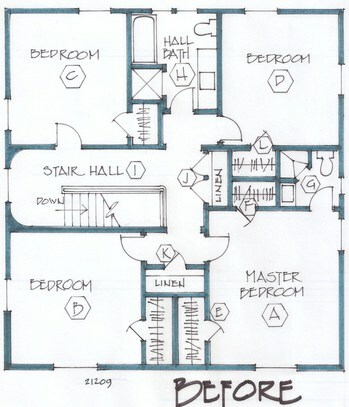 They also did not want to give up a bedroom or the symmetry the floor plan offered. The only opportunity I saw was to utilize some of the closet space. Nobody likes it when I eliminate closets, and my job is to make everything better, so I had to study the closet situation very carefully. There were two linen closets (J & K) in the hallway. Another closet (L) I wanted to claim was in the adjacent bedroom (D). Linen closet (K) was shortened (N) to allow the master bedroom closet (M) to expand into a double, more accessible closet. I added a new closet (O) in bedroom (D) to replace the one I chose to use for the new bathroom. The linen closet (J) will also be used for the bathroom (P). This new bath has a large, ceramic tile shower with a bench. It also has a five-foot long vanity. The toilet stayed where it was. 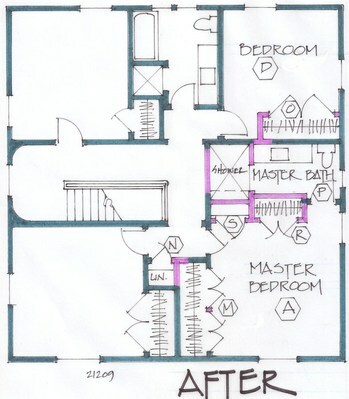 The space behind the master bedroom door (Q) was claimed to add another two closets. One (R) is slightly recessed into the bathroom space, and the second one (S) is more shallow and can be used for additional linen or storage with baskets.